Support the pipe so you don't get vibration noises. If your taking steam out you may need some sort of condensation trap to drain the water. I would use the flexible and zip it on tight, you can use 3-4 together to make up the length. May be worth looking at flexible aluminium vent pipe rather than soil pipe, as it may be easier to fit. This section of roof had no ventilation at all. It's in the sloping bit where the roof used to be, but there's now an extension on the other side. This has been addressed. Celotex and a vapour barrier has gone in under the new plaster board, with a gap behind it to allow air movement, and the soffit vent that was clogged up with old mortar has been cleared. I'd have done the same but something else you could look at is ventilation and moisture. 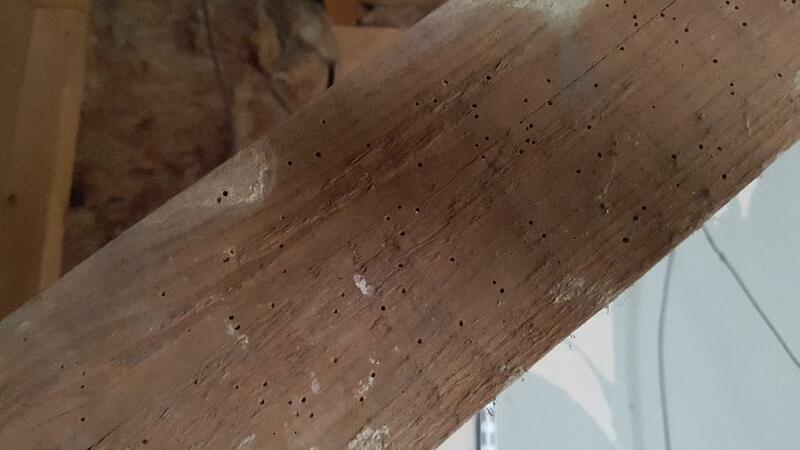 Woodworm like damp(ish) timber. Once the wood gets below 20% moisture content they tend to leave it alone. So check you have adequate ventilation and that there is no obvious ways that moisture in the house can get into the roof space. For instance you can often get woodworm around the loft hatch as warm air from the house condenses on the timber. I'd treat any with holes and for a meter or two in either direction just to be sure. A syringe as used for refilling printer ink carts might be worth using to inject any holes on the underside of timbers. I've now got it all cleaned up, all the plaster dust and old insulation gone, and it's definitely just those 3 rafters affected in any quantity. Others have just got the odd one or two holes in. But none of the new wood that went in when the extension was built around 25 years ago is affected. I assume from this that the woodworm was probably there before the extension, and I'd hope that the guys who built it would have seen it and treated it. It'll all get a good going over anyway, seeing as I'm in here. Would it be worth treating all the other timber in the loft too? That's quite a bit of woodworm and if possible I'd have a look at the rest of the timber in the roof to see if it is likewise affected. If you do find general infestation I would get it professionally treated. If it is just localised to this rafter, or it's the only one you have access to, then I'd get a can or two of aerosol woodworm treatment. Rentokil make them. Be careful when you use it to use a full face mask as you can squirt the chemical into one hole only to find it coming back at you from another hole. Then give the timber a good couple of coats of woodworm killer or 5 star wood preservative. Pulled down the spare room ceiling today (as you do) and have found some woodworm? holes in 3 of the rafters. There isn't a huge number of holes, and the timber still sounds solid when tapped with a hammer. Am I right in thinking that holes mean the little beasties have already sodded off? Do I need to do anything to this timber before replacing the ceiling?